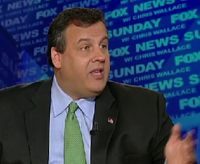 New Jersey Governor Chris Christie appeared on "Fox News Sunday" with Chris Wallace to discuss the response to the Tucson shooting, his thoughts on teacher unions, and the New Jersey budget. "Well, first of, I don't think they look at it as opposing the Obama agenda, first and foremost. They got elected on a set of things that they were promising to do. So they should come down here and now get back to work and do their job. "They set forth a whole number of things they wanted to get done for the people. People put the House in their hands. They now need to get to work." "What you just saw is being straight. I mean, you know, I had a teacher there complaining that she wasn't compensated. There's a whole list of things she wasn't compensated for. And I said, well, you don't have to do it. If you think you're not being compensated fairly, then don't do it. "And I don't think there is a thing about that that is not civil. What I think we've become in this country, and this is why I make a distinction between hostility and vitriol and straight talk, is we've become so politically correct. And so we have gotten into this figuring out how not to answer a question, how to be completely neutral about things. And people have become fogged over listening to political conversation that's like that. "What I'm doing in New Jersey is when they ask me a question, I give an answer."